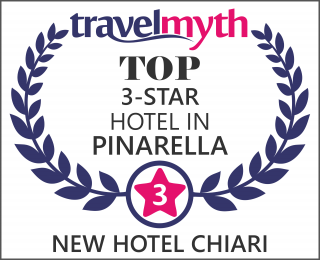 The Hotel is located on the sea front and Pinarella’s beautiful pine forest, and just 50 meters from the town center where you can find many services: STORES FOR SHOPPING, BUS STOP, DRUG STORES, POST OFFICE, BANKS, CAFES, FLEA MARKETS, EVENTS, SHOWS ETC…. ENJOY YOUR HOLIDAY AT NEW CHIARI ! All of our rooms were restructured and renovated. You'll start off your day with breakfast served also in the garden. Our pool has three areas.